The Competition is open to flutists born on or after May 25, 1984. Applicants are required to pay the application fee by either credit card or wire transfer by September 30 (Fri), 2016. All bank charges shall be borne by the applicant. The application fee is not refundable under any circumstances. Applications must be submitted either online or by post as instructed below. <ONLINE> Submit the following materials ① to ③ from the official website. The materials ④ and ⑤, if applicable, should be sent to the Secretariat by post. Taken within the last 6 months of the application date. Front face/from the chest up/ either a black-and-white or color. The photograph will be used in the official brochure and other promotional materials. It must be free of copyrights restriction. Recording of performance for the Preliminary Screening must be selected from the Repertoire provided in a separate section, and the recording must not be edited in any way. Make sure the recorded CD must be playable on CD players in general use. he third person’s signature and contact information must be filled in the Recording Submission Card to prove the aforementioned condition. Name of the applicant must be stated at the beginning of the recording. The application fee could be paid by either credit card or wire transfer. Payment with a credit card can be processed from the official website. <BY POST> Send the flowing materials ① to ⑤ to the Secretariat. Two photographs (5 x 5 cm), one of them shall be attached to the application form. In case of submitting in a digital format, it must be stored on a separate CD from the recording for the Preliminary Screening. A copy of an official document, such as a passport, proofing the applicant’s age. The third person’s signature and contact information must be filled in the Recording Submission Card to prove the aforementioned condition. A copy of document confirming the completion of the wire transfer must be sent to the Secretariat. Only wire transfer payment is accepted. Online application must be submitted by 23:59 (11:59 pm) on September 30 (Fri), 2016 (Japan time). *Inquiries from outside Japan should be made by e-mail only. By signing the application form, the applicant must accept the conditions of participation and the decision of the adjudication panel. There is no right of appeal. Applications which do not meet application requirements will be rejected. Submitted application materials will not be returned. Preliminary screening will be conducted based on materials submitted by the applicants to determine contestants for the First Round of the Competition. Results of the Preliminary Screening shall be sent to each applicant (tentatively scheduled in late December, 2016). Any inquiries concerning the results will not be accepted. Contestants who pass the Preliminary Screening must attend the orientation and the drawing lots that determines the order of performance for the First Round in person on May 24 (Wed), 2017. If a contestant fails to show up at the specified time of the orientation, he/she may be disqualified from the competition. The adjudication panel shall judge the performances according to the Judging Regulations provided separately. The decisions made by the adjudication panel are final. *The order of performances for the Second, Third and Final Rounds will be determined by drawing immediately after the announcement of results for the preceding round. Special prizes may be awarded apart from those mentioned above. Additional awards may be awarded by organizations or individuals who support the objectives of the Competition. All travel expenses shall be borne by the contestant. The Secretariat will bear the accommodation expenses (one single room with breakfast) for the period starting from May 23 (Tue), 2017, two days before the first day of the Competition, to the following dates, only if the contestant stays at the hotel designated by the Secretariat. All other accommodation expenses must be taken care of by the contestant. The contestants, if deemed necessary, are responsible for obtaining insurance covering health care, injury, loss, or damage to the instrument, luggage or other personal belongings in the case of accident, fire or theft during travel and participation in the Competition. Contestants who need to acquire a visa to enter Japan must apply for the appropriate visa on their own responsibility. If an invitation letter or any other document is required for the visa application, the Contestant must immediately notify the Secretariat of this need. For any performance that takes place during the Competition and the exhibition concert, the organizer reserves any rights including neighboring rights to use any audio and/or visual recordings made or photographs taken and to sell or distribute these materials in print, broadcasting, streaming and/or any other media formats. Prizewinners nominated by the jury panel must perform at the exhibition concert to be held on June 4 (Sun), 2017. There is no performance fee to be paid to the prizewinners for this concert. Any problem arising out of or relating to these Rules and Conditions shall be settled in accordance with the Japanese text of these rules and laws of Japan. 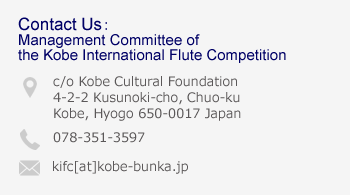 Personal information provided at time of the application will be strictly managed by Kobe Cultural Foundation and will not be disclosed to any third party without the prior consent of the applicants otherwise required under the applicable laws. The highest prizewinners in the Competition may be invited to perform as soloist with music groups for concerts as indicated below.